Small Motors - Big Power! OEMs needed Dumore Motors small permanent magnet DC motors, but with increased power and speed, for applications such as hydraulic pumps, construction pumps, garden tillers, lawn & garden equipment and others requiring a small motor size, but more power and torque. 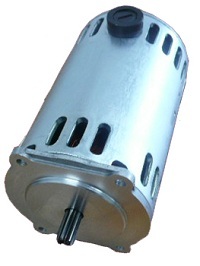 Because Dumore Motors are designed for customization to meet the exact end use application, Dumore engineers were able to quickly provide an ideal cost effective solution by employing a vented enclosure with optional fan cooling for better heat dissipation, Class H (180 C) insulation and replaceable brushes for the long life applications. These open-vented DC motors can be cooled by natural ambient air flow through the motor, or fan cooled, depending on the application.